Taco Bell's latest creation is not an obscene breakfast concoction, but a whole new restaurant. Taco Bell on Monday opened U.S. Taco Co. in Huntington Beach, California, the prototype of what could be a new foodie-inspired, fast-casual chain. The fast-food giant is launching the restaurant in a bid to satisfy Americans' growing hunger for higher-quality food than, say, Doritos Locos Tacos. The menu names are certainly eye-catching, if not necessarily mouth-watering. "The 1%er," for example, is a lobster-and-flatbread taco priced at a cool $9.99. Then there's the Hawaiian-inspired "Wanna Get Lei'd." Less controversial is the "Winner Winner Chicken Dinner" taco. But then you will be asked to "Shut Your Pie Hole" for dessert. Taco Bell says all of the new restaurant's food is made with "high quality, purposeful and responsible" ingredients. Similar claims are made by Chipotle and other fast-casual restaurants that have been steadily taking market share from McDonald's and other traditional fast-food joints. The store's logo and interior look something like an Ed Hardy nightmare of Dia de los Muertos. A massive sign reading "EAT TACOS" adorns the bar, in case you forget what to do when inside the restaurant. 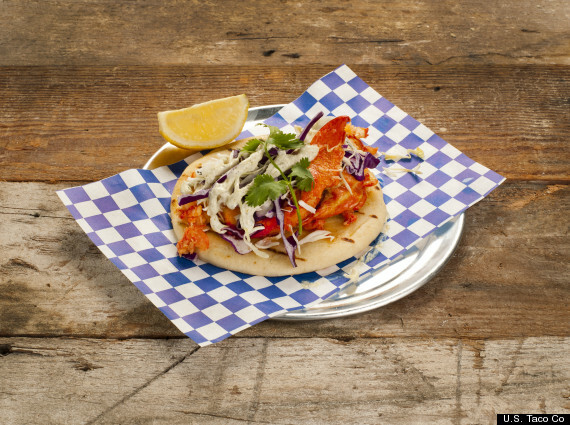 Will Americans pay $10 for a lobster taco? We'll find out on Monday, as the restaurant opens its doors for the first time. The first store is a concept store, but Taco Bell hopes to open a few more around Southern California and then expand beyond the region, depending on success.